ORLANDO, FLA (October 22, 2014) — Over the past few days, Team Nautique athletes, dealers, and employees traveled from Orlando, Florida, to El Salvador and served as part of the Nautique Cares initiative. 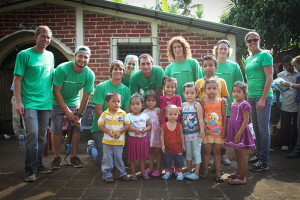 Twenty Nautique athletes, dealers and employees took part in a service trip to El Salvador from October 18 – October 21. The group served by building a school library in the shape of a boat at a rural mountain school for nearly 400 students. The team also had the opportunity to interact with students at the school where they passed out supplies and played soccer with the children. In addition to their work at the school, Team Nautique distributed food to over four hundred needy families in rural mountain communities and provided a water filtration system that will supply the communities up to one million gallons of fresh water. This is the seventh year of service trips for Nautique and each year they continue to grow and provide the Nautique family an opportunity to serve others who need our help. During this time Nautique employees have taken service trips to El Salvador, Mexico, India, Uganda, Kenya, Ethiopia, Dominican Republic, Nicaragua, Guatemala, and the Apache Reservation in Arizona. “Our athletes have served our local community through Nautique Cares initiatives for Give Kids the World and Habitat for Humanity but this was the first time we have taken our athletes or dealers on an international service trip” stated Nautique President/CEO Bill Yeargin. “Our athletes, employees and dealers were all excited to serve; we are all thrilled to be part of a team that wants to not only build the world’s best boats but also use our resources to help others,” added Yeargin.